Even if there are no long-term wholesale price increases, retail prices may still need to accommodate future investment in transmission or distribution infrastructure. For a typical residential consumer, about a third of a power bill is wholesale energy costs, another third transmission and distribution costs, and the remainder is mostly retail costs and margins, and GST. Careful regulatory scrutiny of transmission and distribution investment decisions will continue, to ensure prices reflect underlying costs. 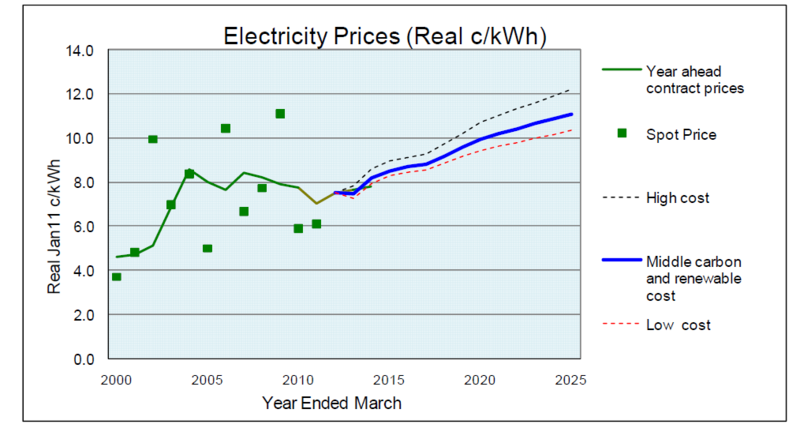 If plants such as the Huntly steam units are permanently decommissioned, then any future demand growth will need to be met by new generation, with a marginal cost of around 9c/kWh (real $2011). In the long term, wholesale prices may need to increase to support new generation investment, as the cheapest generation resources will usually be developed first. Access to New Zealand’s low-cost geothermal resource is likely to be a key factor in limiting wholesale price increases. Generators, land owners (including iwi) and government will need to continue to work together to maximise the economic, environmental and cultural benefits from geothermal resources. While higher carbon prices may lead to higher electricity prices, the increase is likely to be less than for countries that are heavily dependent on fossil fuels, as we still have many relatively cheap renewable resources. This may provide New Zealand an important economic advantage in a low carbon world. "In the long term, wholesale prices may need to increase to support new generation investment, as the cheapest generation resources will usually be developed first."